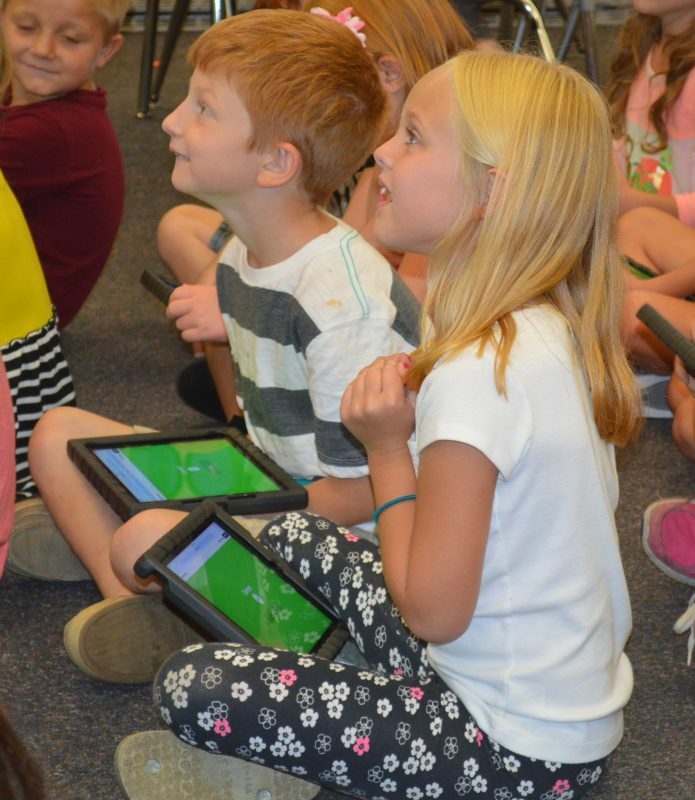 Jaxon Fawley, left, and Sophia Maule are anticipating seeing the results of a math exercise they had been doing on their iPads in Julie Hays’ second-grade classroom at Syracuse Elementary. In another classroom in the same building, fifth-graders in Roger Brady’s class were also attempting to solve math problems. Only they were using their Chromebooks that flip and can function as a tablet or a device with a keyboard. 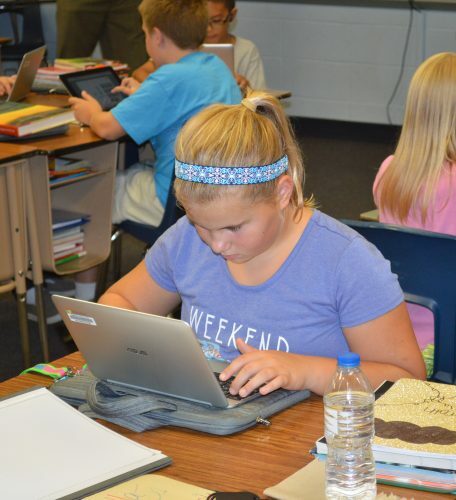 Digital learning has taken a big step within classrooms in the Wawasee Community School Corporation. Only a few months ago, a limited number of students had computers but now everyone does, as well as teachers. Grades kindergarten through third have iPads, four and five have Chromebooks and six through 12 have Chromebooks with touch screens. Months of planning, discussing, testing various devices and contacting other school corporations where students have devices is now a reality. And there was a significant financial investment for the devices, as well as upgrading infrastructure in each school building. Wireless access points were installed, internet filters added and more. Officially, it is known as the 1:1 initiative. Wawasee joins other nearby school districts with something similar in place including Whitko, Warsaw and Plymouth. In Hays’ classroom, the students were excited because they could see almost immediately if they had the right answer as the website tracked responses. And Hays could see quickly who had not answered correctly or may have had trouble logging in. Younger teachers who tend to be more comfortable with technology have made the transition easier, he said. “There is always someone there to help,” he said. Joy Goshert, director of instruction and curriculum for the Wawasee school district, said there have been glitches due to some internet filters not working properly, but she has already heard positive comments from some parents about the devices. They appreciate being able to access some of the programs used in teaching so they can see what their students are doing during the day. Google is being used extensively, such as with Google Classroom where teachers can set up their classrooms and give assignments and then the students can turn in their assignments. This is a transition time for teachers but during the summer classes and seminars were offered, technology coaches are available to help and videos and other online resources can be used too. Fifth-grader Morgan Anderson uses her Chromebook while working on a math problem in Roger Brady’s classroom at Syracuse Elementary.